Pigs are pretty easy to draw. You just break them down into easy-to-draw shapes and half the battle is won. The primary shape of a pig is pretty darn obvious -- you start with that big round oval of a belly. From there the head can be made from a basic circle, and you make two modified triangles to create the slopes of the shoulders and how the "elbows" of the front and back legs work. The snout of the pig is often the hardest thing to draw. The images below, making the snout by creating what looks like a basic "J" shape but thicker are an excellent way to get started. If you draw the pig facing you, making a fairly big circle (pig snouts are pretty large) and two dark spot for the nostrils is fine. One of the lesser celebrated parts of a pig is their ears. They're big! If you are drawing the ears from the side, think of leaves, and make the ears about half the length of the pig's entire head (I told you they were big). If you are drawing the ear from the front, triangles will do. Draw an extra line just inside the top side of the ear to show how the skin curves in. Finally, pigs are often white, but their snouts and the inside of their ears are very, very pink. And don't forget a little curlicue (like a spiral) for the tail. 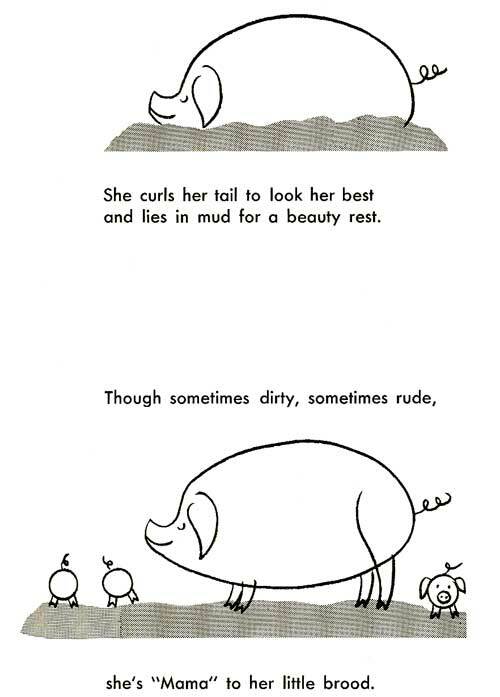 Another way to draw a pig.